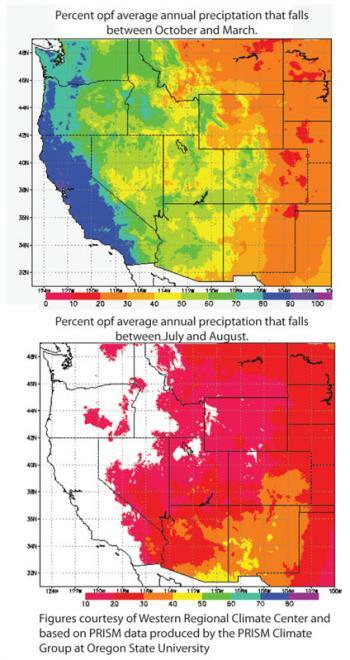 Precipitation in the Southwest has two distinct seasons. Raucous summer thunderstorms characteristic of the monsoon season are spotty, while drizzly winter storms last longer and engulf large portions of the region. Winter precipitation often involves large-scale frontal systems. It can fall as snow in some of the higher elevations, such as along the Colorado Plateau’s Mogollon Rim in northern Arizona. Rain and snow that falls between October and March accounts for nearly half of the region’s annual precipitation (Figure 2). Where northern cold fronts and southern warm fronts meet, the jet stream flows as a current of swift-moving air high in the atmosphere. That’s why climatologists focus on the jet stream when considering precipitation patterns. Similarly, El Niño and La Niña events exert an influence on southwestern precipitation largely by affecting the jet stream. Winter precipitation tends to arrive in blankets of clouds lingering over states for days, delivering moisture in drizzles. This gentle rain is more likely than the pounding summer storms to soak into the ground. As a result, winter precipitation tends to influence regional water supplies more than summer rains. Winter precipitation also plays an important role in forest health. The growth rings of high-elevation southwestern trees typically reflect cool-season precipitation, with more growth occurring in years of abundant snow and rain. Because of this, researchers can use tree rings to reconstruct winter precipitation patterns far beyond the instrumental record which goes back only about 100 years in the West. Winter and spring precipitation also exerts a large influence on when the wildfire season starts and whether grasslands or forests are more susceptible to flame. A lack of cool-season precipitation can make forests more vulnerable to wildfires. Meanwhile, wet winters actually can spur fires in grasslands made lush by cool rains and then cured into kindling during a subsequent dry heat. The monsoon season arrives in the summer, often around mid- to late June. Roughly half of the annual rainfall comes during the summer monsoon in southern Arizona and New Mexico (Figure 2). Monsoon rainfall events tend to be short and spotty, with intense, local storms drenching some areas and neighborhoods but not others. The water the storms bring quickly flows off the landscape into streets and rivers, with most remnant moisture soon evaporating in the summer sun.